I love to make Halloween quilts. In my stash, I have more Halloween fabric than any other theme! I just love the blacks, oranges and other colors that are associated with Halloween. My dog, Mochi, loves to photo bomb my quilt pictures. She is almost always in the picture frame somewhere. Like I said, I have more Halloween fabric than any other. So when I need to have a backing for this quilt, I went to my Halloween bin. Nothing big enough to cover the entire backing but lots of good sized pieces. I put them all together into this unique backing. The black was overwhelming, so I made some pumpkins to go on it. I also found an owl that I had made for something else and never used, so I adhered it to this backing. I actually like the backing as much as the front of the quilt. I wish I had some way to display both sides. I may have to have it hung from the high rafters in my entry way. That might work. I named the quilt Come to My House for Halloween, as you can see on the above label. I really like this quilt. I am not crazy about the quilting. I used a spiderweb pantograph. The quilt is so busy it is hard to see that is the design. Though I did show it to a friend and her 18 year old daughter. The daughter stated she really liked the spiderweb design, so I guess it shows up better than I thought. I am glad she said that. So last night I was going through magazines that I keep with patterns I MAY work on some time in the future. 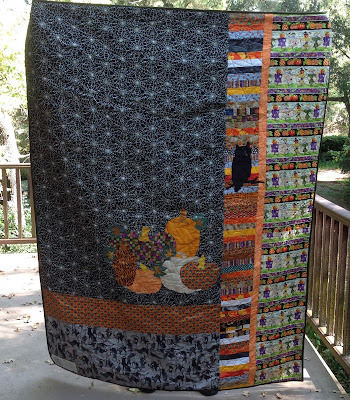 I found three more Halloween/Fall quilts I want to make. Geez, I think this is an addiction! 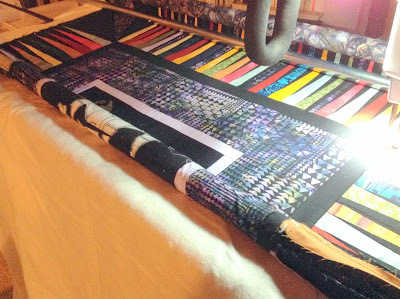 The last two days I have been going through some of my pictures looking at quilts I have made. 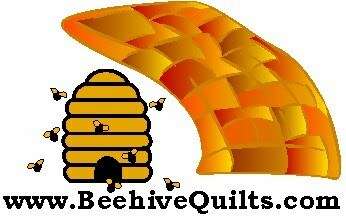 I have listed several of them on the tab at the top of my blog that is labeled My Quilts. I will keep posting them there, so check back from time to time. There is no order how they are listed and not all of them are there yet. Below is the front of the pattern. As you can see, Amy used a theme to her blocks so that they all looked alike. I was not sure how I was going with mine until I had completed two of them. I decided to make each one a little different depending upon the background fabric I chose. The first one I did had a flamingo in it. I love this particular one. 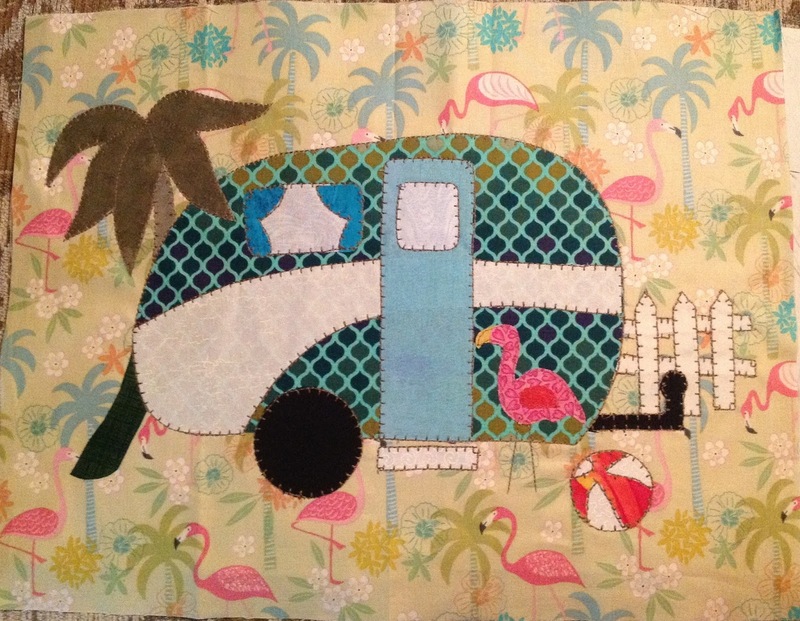 Because of the flamingo, I chose a background of palm trees and flamingos and then put my own flamingo by the camper. The fourth one I did is below. 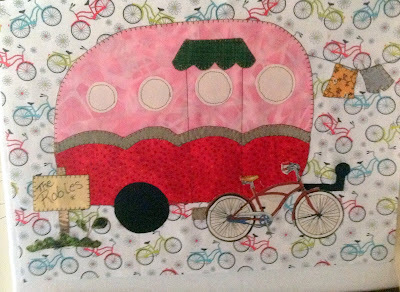 I chose bicycles as my background fabric. On an outing after making this block, I found a fat quarter at a fabric shop that had bicycles in it. Bought it, brought it home and fussy cut a bike out and appliqued it next to the camper. Cute, I think. For some reason, I did not take the other two camper blocks alone. I did take a picture to show Venita what the four I had done looked together. That was a concern for me since they are each so independent from the others. The top two are the others I have not already shown here. I like them both. One is a forest setting background; the other has umbrellas, which the pattern had, too. Each of the blocks will have fabric from the camper of that block sashing it. Then I have purchased (but have not received yet) fabric that has mountains, forests, rivers trucks, cars and campers throughout. I ordered it on line and should be receiving it soon. That fabric will be the sashing and border around all the blocks. 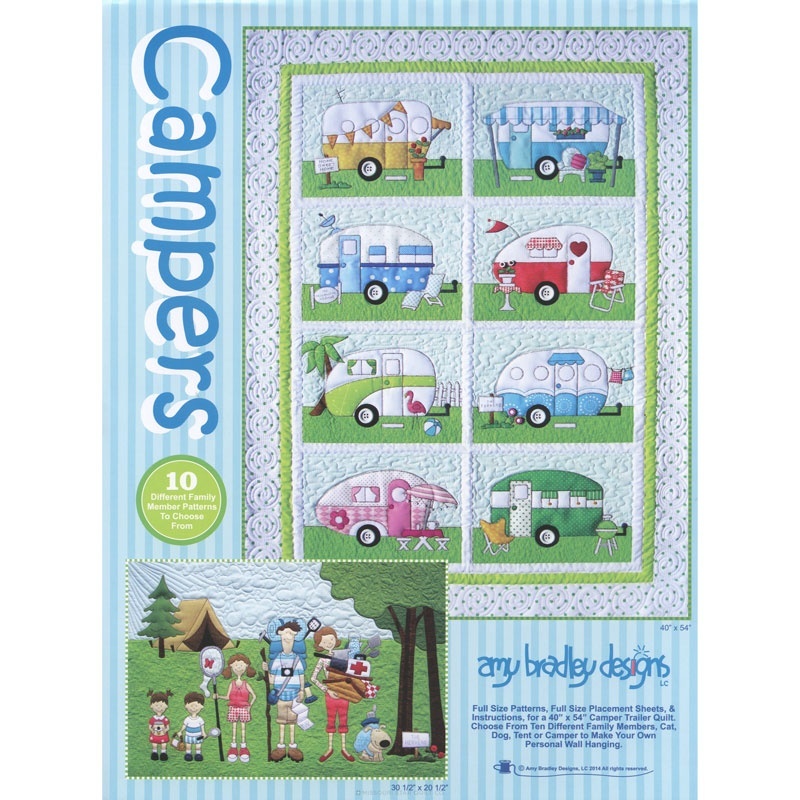 I am also making the block shown on the cover (see the picture of the pattern cover) of a family camping. There is also another block of an older couple camping. I will do that one, too. Plus I am going to make a block of a campground near a lake or river that has only tents. I have to design that one myself. I am so excited to complete this quilt. Venita is getting ready to go off on her vacation, so I guess I will work on the block that I have to design while she is gone. I will post progress as I go along. As stated in my previous post, I sent up some quilts to be displayed at the Oregon Sisters Quilt Show this year. It is the first year I have entered. I entered because I thought we were going to go up there. My quilts did and I didn't. Boo hoo. I would have loved to see my own quilts hung there, though. I wound up sending up three more than I originally stated I was sending. After enrolling those two, I received an e-mail saying I could enter up to 10 quilts to sell in the show, too. I chose three more than I wouldn't mind selling and entered those, too. I sold two of them. I put decent pricing on them - meaning a lot less than it took to make them. But they sold. I got the check last week and it make me happy. The best part is on the quilts I sent up, they sent them back with the information card that was attached to each quilt and a yellow ribbon with the show's name and year the quilt was entered. My plan is to sew the ribbons to be back of each quilt to carry that into their history. I was so impressed with how easy it was to enter and receive back, that I plan on entering again next year. Maybe I will actually make it up there to see my quilts. I decided it might be fun to enter a quilt or two into Sister's Quilt Show in Oregon this year. This morning I got confirmation that the two I decided to enter were accepted. Anyone can enter their quilts, so I did not think I would be declined entry. It will just be fun to say, "This quilt was displayed at the Sister's Quilt Show." Woo woo! Here are the two I entered. The Castle one is a quilt I am really proud of. 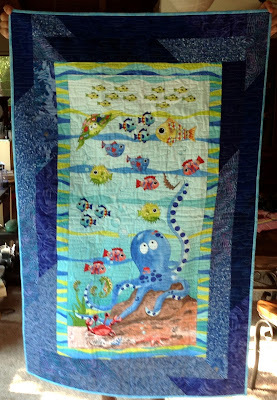 I do a lot of applique quilts, but this was probably the most complicated. I took a class from Barbara Olson last spring through my quilt guild here in Sacramento. She taught us how to make it and got us started. After I finished the initial block, I was not sure what kind of border to put on it. I decided to put the paper pieced border you see on it. I think it added a nice touch to the quilt. Right now the quilt is hanging over a staircase in our house. The other quilt I call African Batik. I purchased the star fabric at an African store in Fort Bragg California several years ago. I could not decided how to use it. 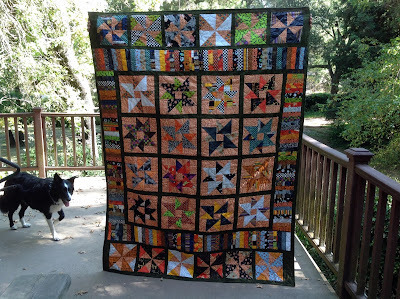 Finally last year I put it together in this quilt. I quite like the colors and am surprised I actually purchased that bright yellow fabric for the background. I usually like more subdued colors. But there it is! This one is currently on my wall in my living room. Lorena will have to get that down for me, so I can get it sent off to Sisters Oregon. I don't know if I am going to Sister's this year. Maybe now that I have to go since I two quilts entered in it. Above is my Castle quilt on the quilting frame while it was being quilted. My oldest son is quite the chef. He can make anything taste good - even brussels sprouts. I made this quilt for him probably two years ago but never quilted it. Yesterday I decided I needed to work on unfinished quilt tops. This was the smallest and probably the oldest finished quilt top. I even had the batting and backing already prepared and sitting with it. I just had to decide what color thread to quilt it with. I chose gray. I still need to bind it. I had extra of the border fabric at one point, but it got pulled into another quilt. So I need to find something else that will blend well with the quilt and get that done. I really like it. It is very small. It is only 18" x 24" - a nice wall hanging for his kitchen. I got the pattern from our guild's "free" table one evening. 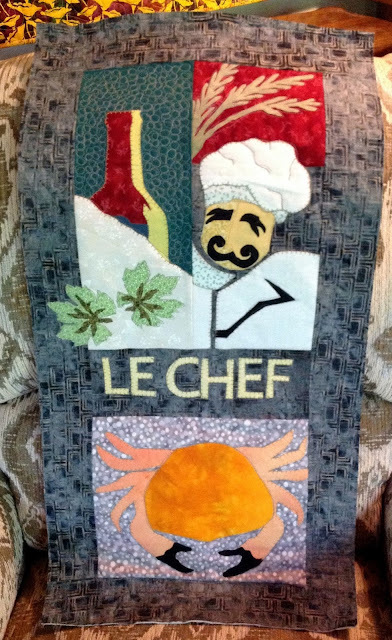 It is from Mount Redoubt Designs called Le Chef. It has several other applique patterns in the book I may try. I am glad I made this one. It turned out great. There were a lot of quilts submitted from people that reside in Japan. At first glance you would think this one was given the theme of the paneled quilt. It was made by Karen Turnbull from Laguna Niguel California. She named it Red Temples. I love how she hooked the three panels together with a pagoda style beam at the top. The above quilt is named appropriately Skyline. Claudia Scheja from Werne North Rhine-Westphalia Germany made this beautiful quilt. Love the different skylines she incorporated in the border from different cities around the world. Advance to Tomorrow by Miycko Watanabe from Kobe Japan is another city-scape. I love the city, ocean, mountains and sky. I would be interested to hear the quilter's explanation of the star eclipsing the town. Here is The Woman by Kyoko Ochiai from Ota Tokyo Japan. Reminds me of 1950/60's women styles you would see in advertising. I really like the design. I was alone at the show. The thought I had when I saw this quilt and would have shared if there had been someone there to share my thoughts with would have been, "Here is a quilt design I would never make but would love to have in my home." I am not a blue person but I can overlook that with the colors that are throughout this quilt. It is called Supernova and made by the Annapolis Quilt Guild of Annapolis Maryland. Gladiolas (I think). I am not a flower person but I think that is what these are. Whatever they are I would love to have them growing in my garden. It is called In the Height of Summer and made by Hatsue Abe and 10 Friends from Setagaya Tokyo Japan. Flamingos always make me smile. I love these multicolored flamingos. How sweet they are. It was made by Kazue Kamura and 10 Friends from Setagaya Tokyo Japan. It is entitled Family of Rainbow-Colored Flamingo. Another beautiful garden-scape. Love the kitty and cat on the sill at the bottom of the quilt. This is called Japanese Summer and made by Sachico Kumano and 11 Friends from Setagaya Tokyo Japan. Those of you who know me know that I love Halloween! 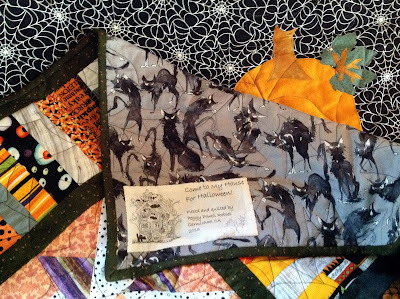 I love Halloween quilts more than any other. 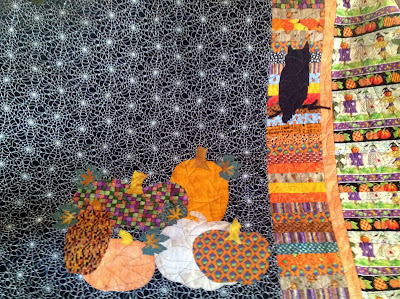 The quilt above and the close up below is not one of my most favorite Halloween quilts, but it is a charming one. I love how the quilter added three dimensional items to the quilt, as you can see in the block below. Halloween Party was made by Noriko Nishikawa and 11 Friends from Setagaya Tokyo Japan. Some quilts just do not photograph as nicely as they display in reality. The above quilt is one of those. This quilt is truly stunning. The colors work well together. Yet not so much in the photograph. It was made by Tomoko Takauchi and 15 Friends from Setagaya Tokyo Japan. They call it A Bouquet. 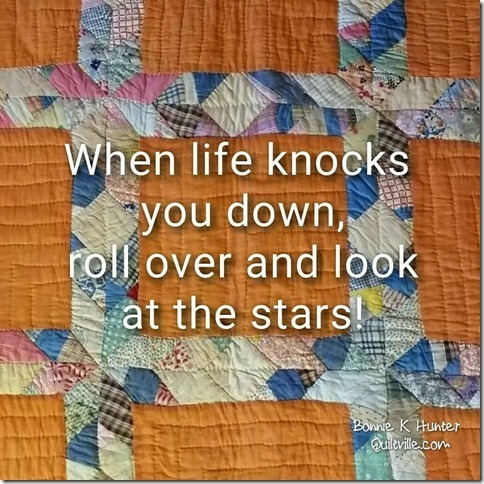 Click to enlarge to see the quilting on it. It looks like each block was quilted in and of itself. 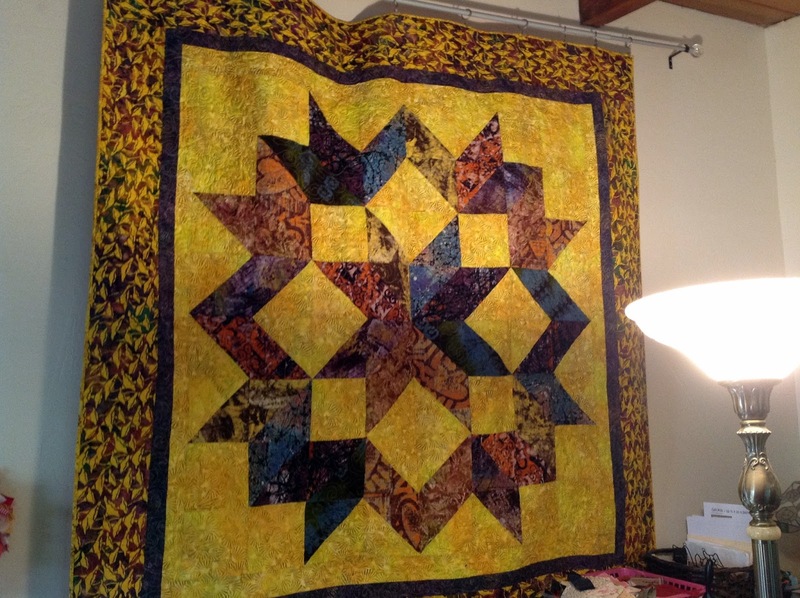 Since it was a quilt made by multiple people, perhaps each quilter quilted their own block. It works nicely though. International Sun Bonnet Sue. My daughter has this pattern. I have looked at it several times and thought I would like to make a version of it. There are so many Sun Bonnet Sue's in the pattern book, you have to choose which ones to make. Otherwise the quilt would cover three beds easily. As you can see the Sues are small but each one is so charming in and of itself. I love how the quilter included the nationality of the Sue and the maker of the block in the two blocks at the bottom middle of the quilt. This was an international Sun Bonnet Sue Swap quilt. What fun that must have been to receive the different blocks in the mail. This was put together by Vicki's Friends Pszczyna Poland. The above two pictures represent a quilt called Vintage Blocks -- Tossed But Not Forgotten. As quilters we often have what I call orphan blocks. They are blocks that we made but they didn't work into the quilt that they were planned for or we made too many or it was too small or whatever the reason they just sit around by themselves. 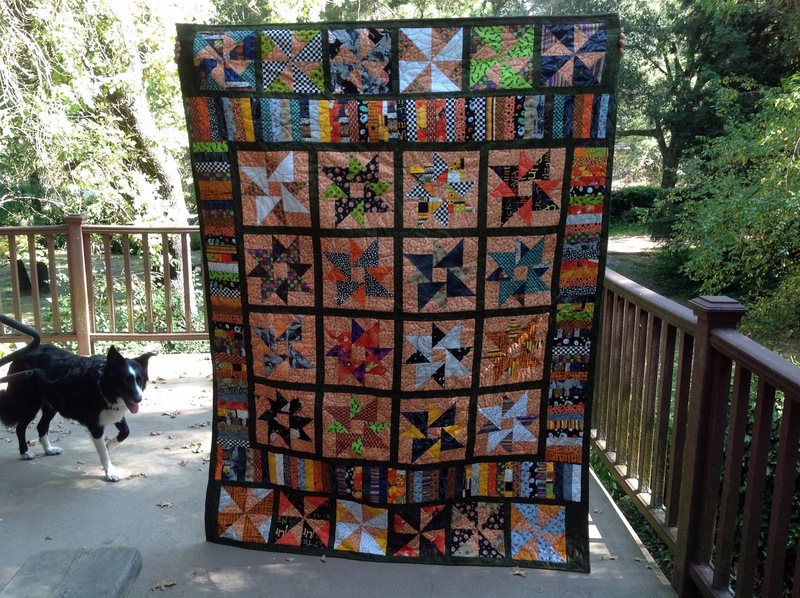 I love how this quilter put them together into a quilt. Best of all I love how they were quilted. Look at the top picture up close - click it to see even better. The quilter is Jane V Cole and Quilters from Waynesville North Carolina. This has been fun going through these quilts. 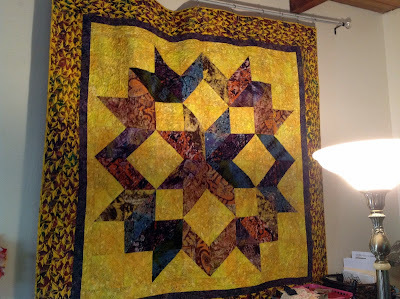 It has made me want to work on more of my quilts. I have so many unfinished quilts and quilt kits and patterns I have purchased, some with fabric and some without. I just need to get something out and work on it or at least finish one. Maybe I will go do that now. I will post more Paducah quilts at another time. Thanks for looking. I have been back from Paducah for weeks now and I still have not gone through all my photographs! I am going to post them as I edit them since I took close to 600 photos my week in Paducah and traveling around Tennessee and Kentucky. One of the cautions about taking photos at the quilt show was that if we posted them on the internet, we should give credit to the creator of each quilt. I will do that to the best of my ability here. Know also I did not take a picture of every quilt there. There were so many of them. My first day at the quilt show I went directly into the main exhibit hall to see the quilts. As that day and the next went on, I found there were two more exhibit halls in that building and another building a little ways away that had even more. Oh my goodness. The first quilt I saw in the main exhibit hall is the horse quilt above. I know I am going to use the same descriptive words over and over as I tell about the quilts I saw. This quilt was amazing! Even as I look at the pictures I am amazed it is a quilt. It was made by Laurie Britt from Bakersfield CA. To take all these pictures, I used our Nikon camera. 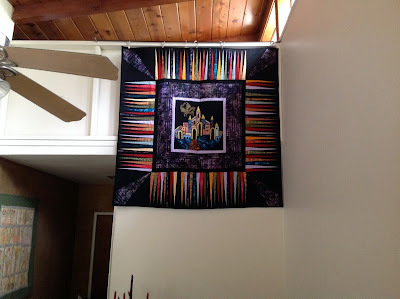 I was so impressed by this quilt and the next one, I wanted to share them immediately. I also took pictures of them with my phone so I could text them to different people right way. My daughter is a horse person. I sent this to her. She immediately texted me back asking me to bring it home to her. "Yeah sure." Someone might notice me taking a quilt down and walking out with it, especially since it is the first display you see as you walk in. She is a quilter, too, so I told her to just make one of her own. Her answer back to me was the same I had given her, "Yeah, sure!" The quilt above was made by Hiroko Miyama and Masanobu Miyama from Chofu Tokyo Japan. The title is Duck Face. It is a lovely quilt. The child looks angelic. The dog looks somewhat like my son's dog, Dexter. It was hanging in the same display as the horse quilt. These two quilts started my jaw dropping excursion through the quilts. Above is Crossing Over done by Lea McComas of Superior Colorado. To see this quilt up close is to see some remarkable thread play. The rider's hair looks like it was truly braided. How beautiful this quilt is. Click on this or any of the pictures to see them up close. 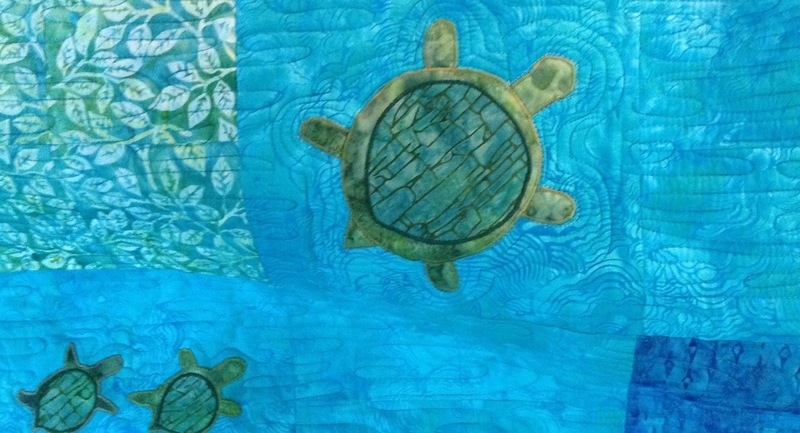 Look at the quilting on this quilt by Karlyn Bue Lohrenz of Billings Montana. These are just four of the hundred or so quilts I took pictures of. More to come. I had some fun working on this quilt. 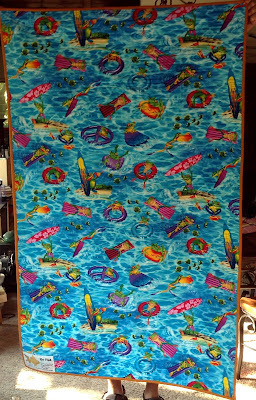 I quilted it for my friend, Venita. I call it her Blue Turtle Quilt. It is really a cute quilt. I was alone when I took the pictures. I should take one showing the whole quilt. 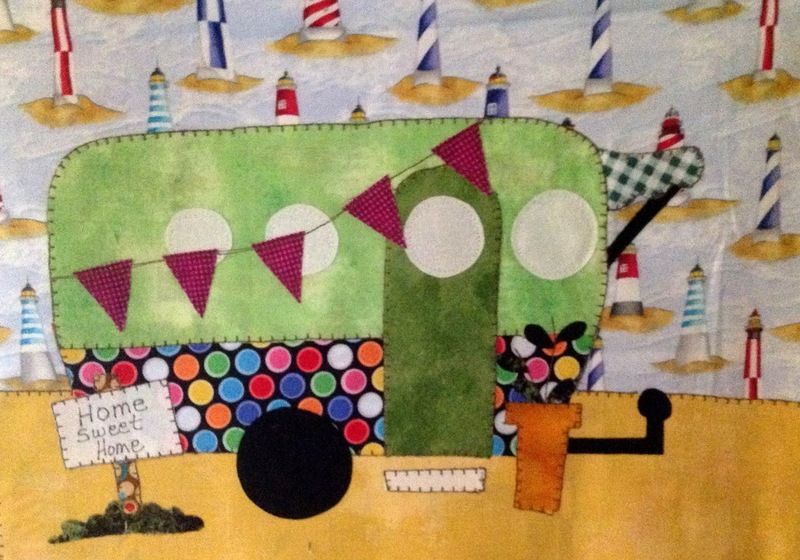 She has a ukulele and flip-flops and other applique. Love it. 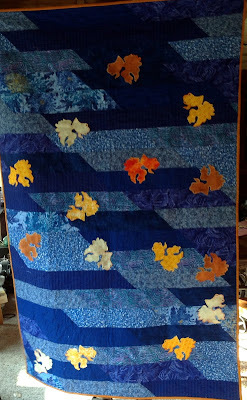 I used a quilt design that looks like water. Seemed appropriate. It is a design we practiced at the long arm quilting class I took while at Paducah. The Foothill Quilters Guild quilt show was held over this past weekend. I always love going to see their quilts. Beautiful always. Here are the pictures I took there. The quilts shown here were in a display of a guild member that passed away shortly before the show this year. Oh my goodness! Look at those tiny pieced blocks. Below is a close up of it. 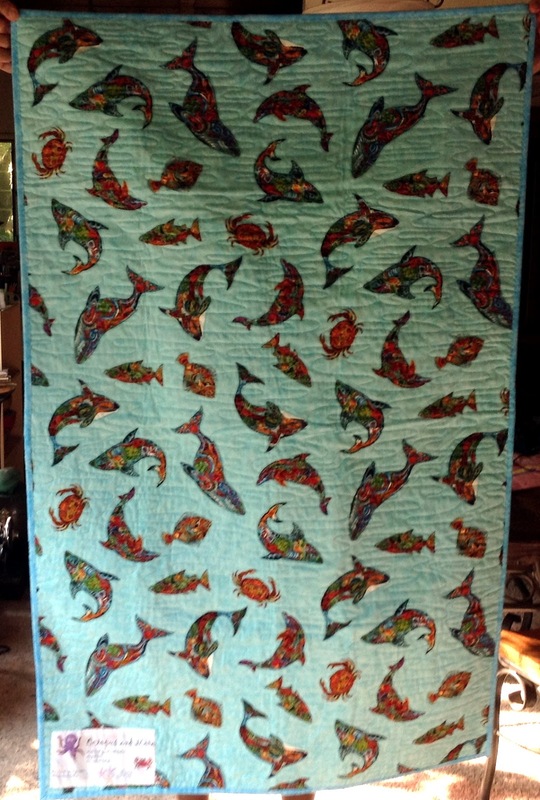 Look at the border of dolphins, plus the fabric she chose really makes this a stunning quilt. This was the flyer posted at her display. On the bottom of the flyer it stated "in loving memory of Margarita Wilcox February 24, 1932 - February 22, 2016. 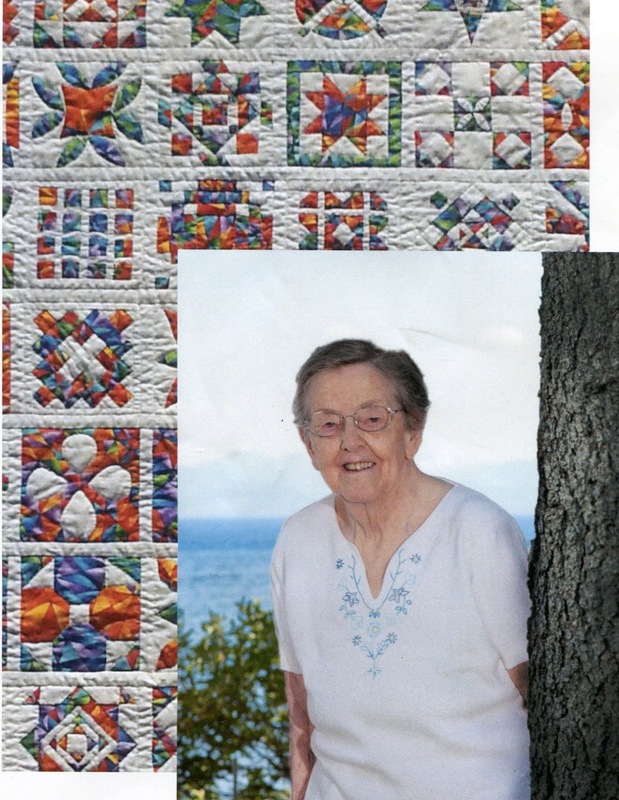 What a wonderful tribute to a lady that made beautiful quilts. The featured artist is Patti Henderson. Here are a few of her quilts. I love this quilt. I love the beautiful fabric and the simple design. Pretty cool chair. Most of it is painted - all except the seat. Great job. This is a close up of the lizard quilt. I wanted you to see the metallic thread art on the plant. Quite effective. Embroidery. One of my favorites. Around the world. Love the border full of leaves! Those of you that have seen my posts on quilt shows before know that I always gravitate towards Halloween. I have more Halloween themed quilts than any other. I make no less than one a year. Much of my fabric is Halloween colors and designs. I look for Halloween ideas. I love this one. On Pinterest you see lots of garden items made out of tea cups or tea pots and placed on posts to put food or water out for birds. Here is the theme done in quilting. So cute. 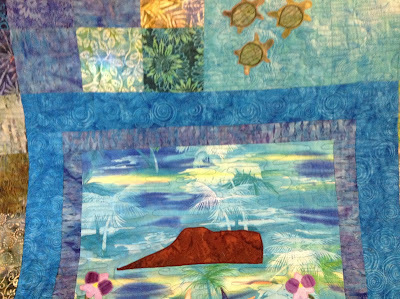 The above is the guild's Opportunity Quilt. Each block is made using the exact same pattern but with different fabrics. This really shows off what happens with just changing the fabrics. Lovely quilt. The theme was Fruits of our Love and Labor. The center block is a bunch of cherries and the border and backing are cherry fabrics, too. Then each of the volunteers at the show were wearing a name tag with cherries attached to them. I loved the theme running throughout the show that way. 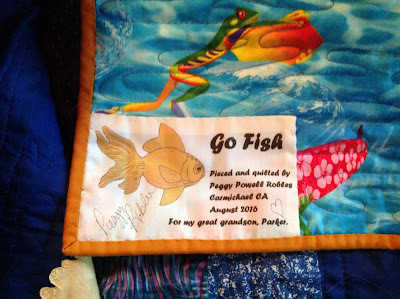 I bought tickets for this quilt and waited by my phone Sunday afternoon for the call that I won the quilt. The call never came. Darn. I really love this quilt. The above quilt is a huge quilt. 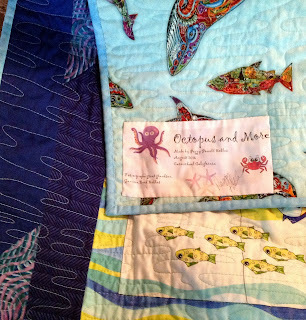 The quilting (which doesn't show up well in the picture) is of sea shells and star fish. Below is a close up of the fishing vessel coming into port. T-shirt quilt. The t-shirts are from all over the world. Great way to document travels. Purple and orange blocks. Interesting color combinations here. Very pretty. Of course I would take this picture. It has a border collie in it! The black blocks are done in Sashiko stitching. It doesn't show up well in the picture. Truly beautiful on the quilt. Adorable horse quilt. I also love how the guild puts a picture of the quilter with each quilt. It really personalizes the quilt. House quilt done with Halloween fabrics and embellishments. I want this quilt. I made this exact same quilt. Well it is the embroidered blocks I made. She did hers on white background. I did mine on beige. She used bright colored threads. I used muted, soft colored threads. I like mine. I like hers more. More embroidery. I love they are set on point. Love the quilt on the right. 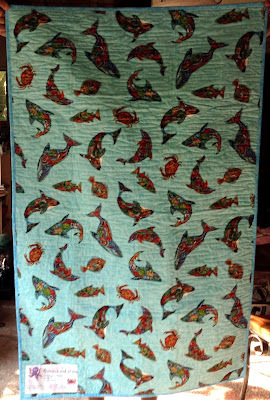 The quilt used Hawaiian themed fabric throughout to make such colorful fish. The two above are almost identical quilts. Almost. I have this pattern. I believe it is an Alex Anderson pattern. Look at all those circles! Oh my goodness. The guild did a great job in setting the quilts out. Lots of room between the rows. Lots of light to see them with. The guild even hung some from the rafters. I am afraid they get missed in all the glory on the racks below. Halloween and Embroidery. Can't get any better. Give me one quilt I will never, ever made, Alec. Stunning, though. This is a quilt I will make one of these days using me as the model. Well, maybe. Or maybe my dog instead. I don't know I want a quilt of ME! I do like the concept though. The above and the one below is using the challenge fabric the guild selected. This doll above is so striking. Some people look at fabric way different than I do, for sure. The way the "water" is framed by the leaves it makes it look like there is really water! The above is a round robin. The first quilter did the center block. The rest followed her/his lead. Wow! More of the challenge fabric. I think instead of fabric, they were given the flowers. The flowers are in every item. As we walked out of the building that had the quilts on display, we came across this peaceful Koi pond with the old mining cart sitting next to it. I have to admit the Auburn Fairgrounds is a great place for a quilt show. Lots of walking between the buildings, but that helps narrow down the amount of people in any one building. It was a very successful show. I am glad Venita and I went.